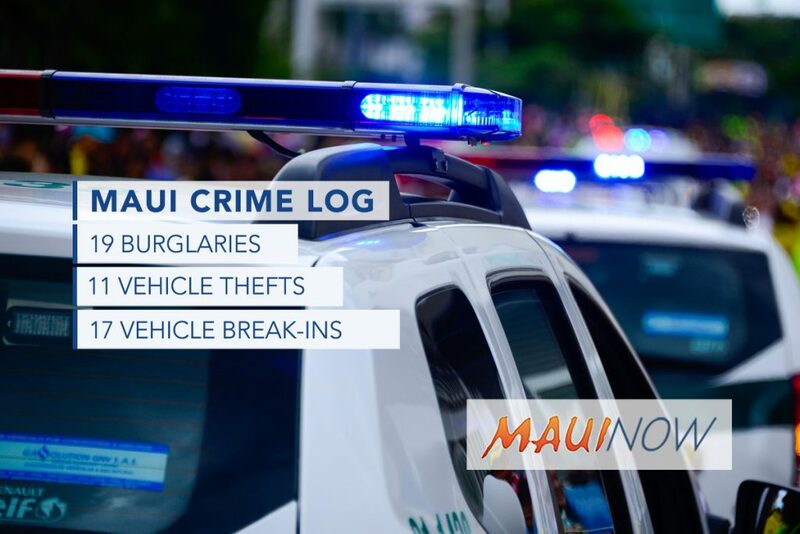 Maui Crime log for March 24 to 30, 2019. 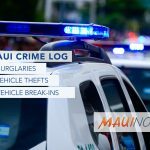 Maui police responded to 19 burglaries, 11 vehicle thefts and 17 vehicle break-ins in Maui County over a seven day period from March 24 to 30, 2019. 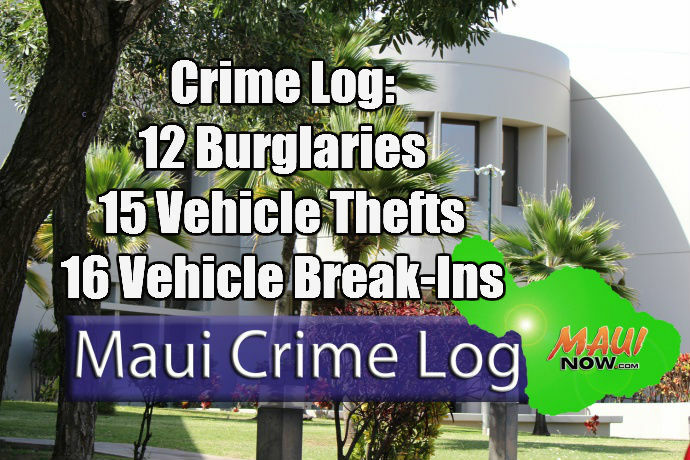 Burglaries and vehicle thefts were up and vehicle break-ins decreased from week before levels. Burglaries were up +72% from the week before when 11 incidents were reported over the seven day period. 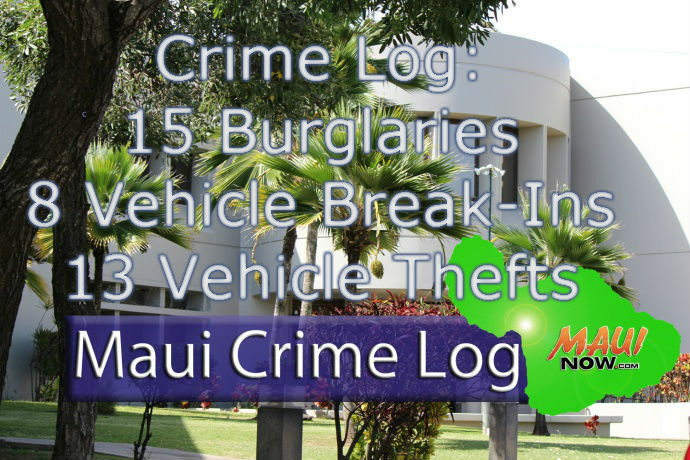 Vehicle thefts were up +57% from the week before when seven incidents were reported; and vehicle break-ins were down -48% from the week before when 33 incidents were reported. Wednesday, March 27, 8:13 a.m.: 400 block of Kawelo Rd, Haʻikū. Residential, unlawful entry. Wednesday, March 27, 12:51 a.m.: 275 Kaʻahumanu Ave, Kahului at QKC / Verizon Kiosk. Non-residential, forced entry. Wednesday, March 27, 8:12 a.m.: 275 Kaʻahumanu Ave, Kahului at QKC / Volcano E-Cig Kiosk. Non-residential, forced entry. Tuesday, March 26, 5:09 p.m.: 800 block of S Kīhei Rd, Kīhei. Residential, forced entry. Thursday, March 28, 7:27 a.m.: 800 block of L Kimo Dr, Kula. Residential, unlawful entry. 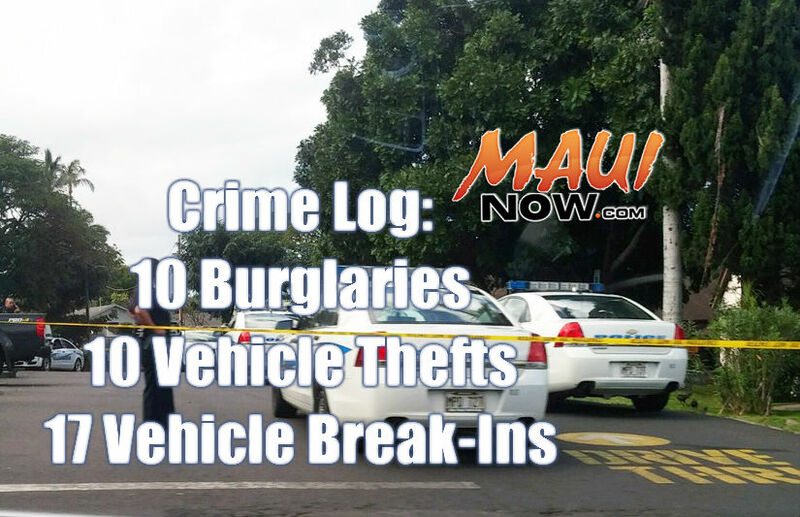 Wednesday, March 27, 8:17 a.m.: 100 block of Camp Olowalu Rd, Lahaina. Residential, unlawful entry. Sunday, March 24, 11:26 p.m.: 3367 Maunaloa Hwy, Hoʻolehua. Non-residential, unlawful entry. Monday, March 25, 7:06 a.m.: 201 Ala Mālama Ave, Kaunakakai at Haunani’s Florist. Non-residential, forced entry. Wednesday, March 27, 5:17 a.m.: 200 block of Ala Mālama Ave, Kaunakakai. Residential, forced entry. Wednesday, March 27, 6:46 a.m.: 100 Ainoa St, Kaunakakai at Parks and Recreation Office. Non-residential, forced entry. Wednesday, March 27, 7:31 a.m.: 16 Kamoi St, Kaunakakai at Bobo’s Auto Service. Non-residential, forced entry. Wednesday, March 27, 7:44 a.m.: 16 Kamoi St, Kaunakakai at Cory’s Lunch Wagon. Non-residential, forced entry. Wednesday, March 27, 2:11 p.m.: 250 Lamaloa Pl, Kaunakakai. Non-residential, unlawful entry. Wednesday, March 27, 5:28 p.m.: 79 Ala Mālama Ave, Kaunakakai at Kanemitsu Bakery. Non-residential, forced entry. Thursday, March 28, 7:12 p.m.: 3500 block of Puʻu Kapele Ave, Hoʻolehua. Residential, forced entry. Saturday, March 30, 1:54 a.m.: 3500 block of L Honoapiʻilani Rd, Nāpili. Residential, forced entry. Tuesday, March 26, 8:30 a.m.: 1600 block of Mill St, Wailuku. Residential, forced entry. Wednesday, March 27, 8:04 p.m.: 2200 block of Mokuhau Rd, Wailuku. Residential, unlawful entry. Thursday, March 28, 1:10 p.m.: 1500 block of Koene Pl, Wailuku. Residential, unlawful entry. Sunday, March 24, 8:18 p.m.: 700 block of Hamana Pl, Haʻikū. NPC059 2004 Jeep Wrangler, white/black. Sunday, March 24, 3:19 p.m.: 200 block of Lāʻau St, Kahului. MHY207 2001 Chevy Blazer, red. 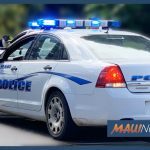 Wednesday, March 27, 6:08 p.m.: Molokaʻi Akau St / Pōhai St, Kahului. MSG558 2007 Nissan Frontier, blue. Thursday, March 28, 7:11 a.m.: 1 Kahului Airport Rd, Kahului. JXD638 2002 Toyota Tacoma, white. Saturday, March 30, 12:57 p.m.: 300 block of Niʻihau St, Kahului. MBZ850 1996 Honda Civic, silver. Sunday, March 24, 1:50 p.m.: 145 N Kīhei Rd, Kīhei at Sugar Beach Resort. LJB216 2018 Chevy Camaro, red. Monday, March 25, 1:45 p.m.: 15 Kapoli St, Māʻalaea at Carl’s Jr parking lot. LGE914 2005 Ford passenger van, white. Friday, March 29, 12:16 a.m.: Makawao Ave, Makawao at Municipal parking lot. MPL273 2004 Toyota Tacoma, green. Monday, March 25, 9:42 a.m.: 55 Pukalani St, Pukalani at Foodland. MGA633 2000 Mazda B3000, white. Wednesday, March 27, 4:19 p.m.: 1486 Honoapiʻilani Hwy, Waikapū at Waikapū On 30. MSS536 1986 Nissan pickup, green. Thursday, March 28, 1:55 p.m.: 400 block of Hoʻokahi St, Wailuku. 519MDE 2007 Chevy Silverado, white. Sunday, March 24, 6:03 p.m.: 13800 Kahekili Hwy, Kapalua at Nākālele Pt. 2016 Honda CRV, silver. Sunday, March 24, 8:05 a.m.: 140 Uwapo Rd Kīhei at Kīhei Villages. 2001 Ford Ranger, white. Monday, March 25, 12:05 a.m.: 300 block of Kinaʻole Cir, Kīhei. 2005 Chevy Trailblazer, gray. Sunday, March 24, 2:22 p.m.: 820 Olowalu Village Rd, Lahaina at Leoda’s Kitchen and Pie Shop. 2001 Ford Ranger, white. Sunday, March 24, 2:22 p.m.: 820 Olowalu Village Rd, Lahaina at Leoda’s Kitchen and Pie Shop. 2011 Nissan Altima, white. Sunday, March 24, 4:35 p.m.: 400 block of Front St, Lahaina. 1998 Ford Ranger, gray. Wednesday, March 27, 3:28 p.m.: Māla Wharf Rd, Lahaina at Māla Wharf. 1996 Isuzu Rodeo, silver. Tuesday, March 26, 9:00 a.m.: 100 Hauʻoli St, Māʻalaea at Lauloa. 2006 Ford Ranger, red. Wednesday, March 27, 8:43 a.m.: 200 block of Lamaloa Pl, Kaunakakai. 2003 Ford Explorer, green. Sunday, March 24, 6:49 p.m.: 100 block of Kaiea Pl, Pāʻia. 2006 Toyota Rav4, gray. Sunday, March 24, 9:22 a.m.: 6600 Mākena Rd, Wailea at “Big Beach.” 2007 BMW 328i, silver. Sunday, March 24, 9:22 a.m.: 6600 Mākena Rd, Wailea at “Big Beach.” 2017 Nissan Leaf, blue. Sunday, March 24, 9:26 a.m.: Dead End / Oneloa Beach South Rd, Wailea. 2018 Jeep Wrangler, gray. Sunday, March 24, 9:26 a.m.: Dead End / Oneloa Beach South Rd, Wailea. 2007 BMW 328I, silver. Wednesday, March 27, 6:10 p.m.: 3572 Wailea Alanui Dr, Wailea at ʻUlua Beach. 2017 BMW 330i, white. Thursday, March 28, 11:42 a.m.: 100 block of N Market St, Wailuku. 2000 Dodge Ram 2500, white. Thursday, March 28, 11:42 a.m.: 100 block of N Market St, Wailuku. 2014 Dodge Durango, black.